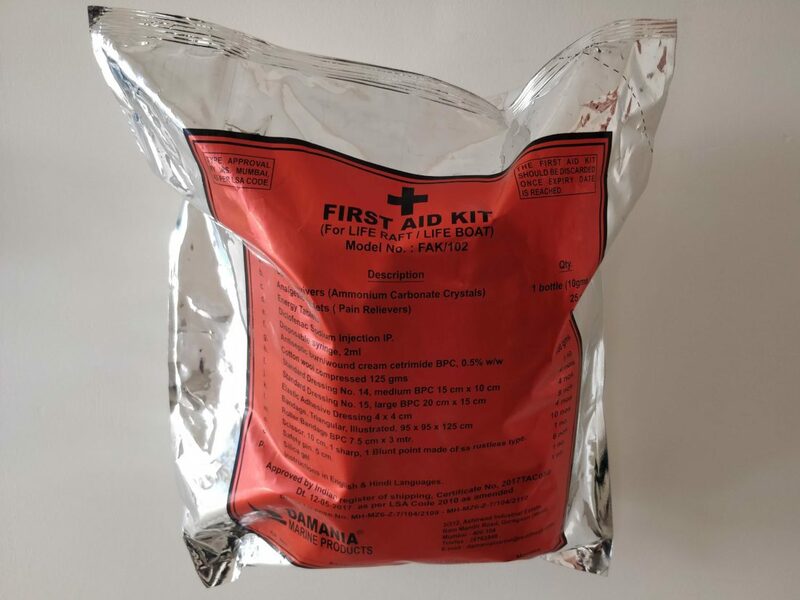 First Aid Kit can be packed in a Box or Pouch as per the customers’ requirement. Collapse Reviver (Ammonium Carbonate Crystals) 1 bottle (10 gms). Analgesic Tablet (Pain relievers) – 25 nos. Energy tablets – 60 nos. Disposable Syringe 2ml – 6 nos. Antiseptic burn/wound cream cetrimide BPC 0.5% w/w 100 gms. Cotton wool compressed 125 gms – 1 no. Standard dressing no. 14 medium BPC 15 cm x 10 cm – 4 nos. Standard dressing no. 15 large BPC 20 cm x 15 cm – 4 nos. Elastic Adhesive dressing 4 x 4 cm – 6 nos. Bandage, triangular, illustrated 95 x 95 x 125 – 4 nos. Woven bandage BPC 7.5 cm x 3 mts -10 nos. Scissors 10 cm, 1 sharp & blunt point made of SS rust less type – 1 no. Safety pin 5 cm – 6 nos. Silica gel – 1 no. Instructions in English & Hindi Languages -1 no. First Aid Kit have been tested in accordance with M.S. 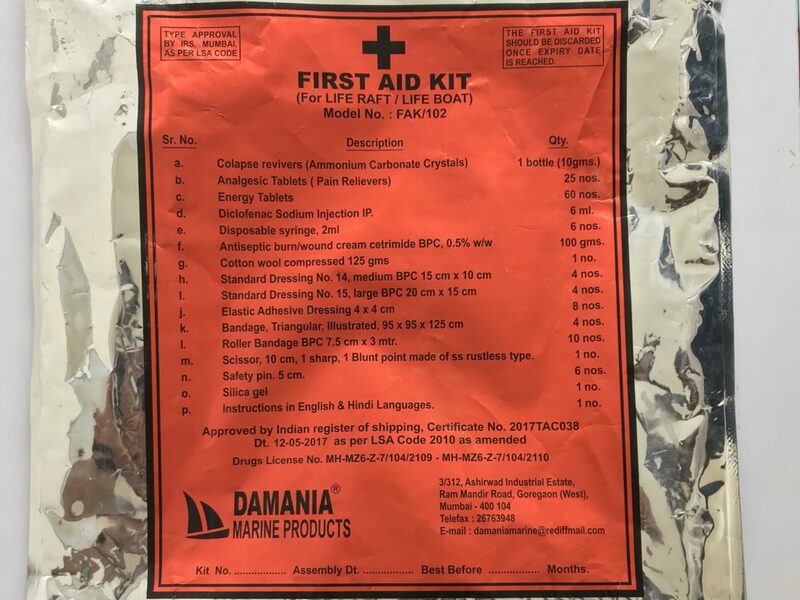 Life Saving Appliances Rules 1991, as applicable and MSC 81(70) and is approved for use on Ships. The approval is given by IRS, Mumbai via Certificate No.2013TAC030, dated 4th July 2013.